It’s 2008 and locks haven’t really changed much. Sure, we have RFID based access control systems and biometric (fingerprint) but those typically cost a lot and can’t be easily retrofitted. 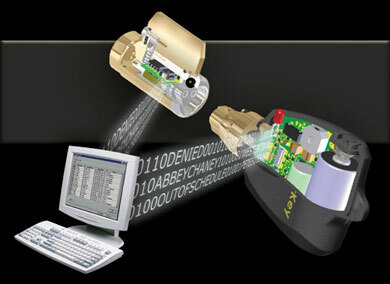 I just found out about a company called Videx and their Cyberlock system. CyberLock cylinders are electronic versions of standard mechanical lock cores so they can be easily retrofitted and because they have no keyway, dirt and moisture cannot interfere with the operation of the lock. Each cylinder has a unique ID and is programmed with access codes that identify it as belonging to a system. CyberLock cylinders have memory for storing the most recent 1100 access events: the keys that have contacted the lock, with the date and time of the contact. The cylinder even stores when an unauthorized key tries to open it. The battery in the CyberKey is what powers the CyberLock system. When the key touches the lock, the battery powers the circuitry in the CyberLock so that the key and lock can communicate. Two different keys are available: one with a replaceable 3-volt battery and one with a rechargeable lithium ion polymer battery. I’m really thinking about switching out my locks to they CyberLock system… I’ll find out what cost is, but based on my initial conversations, it sounds like typical locks range from $200-$300 each and $90-$150 for a key.